The 2016 season was a rough one for Nebraska’s specialists. After losing teammate and friend Sam Foltz, the Husker specialists marched on in his honor. It was a roller coaster at times, especially as punter Caleb Lightbourn battled through a season he was originally intended to redshirt. By the end of it, the specialists came through it closer than ever and ready to take the next steps forward. 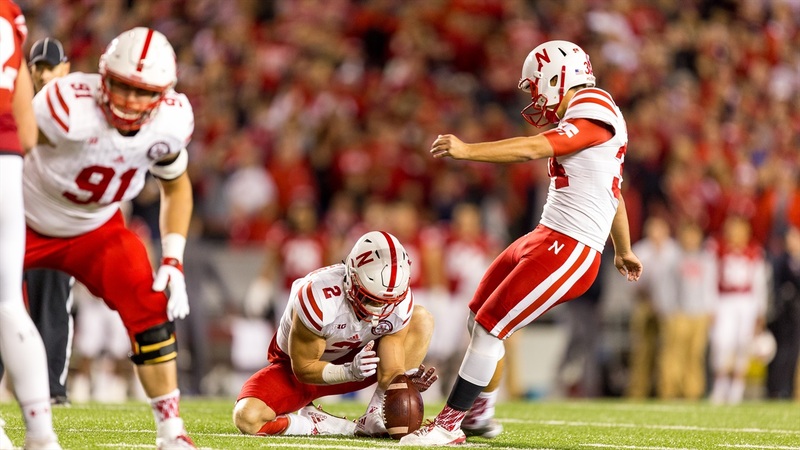 During Nebraska’s first press conference of spring football, senior kicker Drew Brown talked about life after the departure of special teams coach Bruce Read. After Coach Mike Riley fired Read in late-November, Brown and his teammates worked closely with graduate manager for special teams, Nick Smith. They focused on fundamentals, but Brown has always prepared himself for the day when there may be a gap in coaching. “I try to teach myself as much technique as I possibly can just in case something like were to happen where we have a void in special teams coach like we do now,” Brown said. As Brown prepares for spring football to begin, he expects to be the primary kicker for the Huskers in 2017. Brown is also Nebraska’s only kicker on the roster for spring, with Omaha Burke’s Cole Frahm set to join him this fall. In the meantime, current Huskers will likely step in to help Brown on the kicking front. Brown has no intention of taking any steps backwards and will be using the spring to improve upon his craft. Lightbourn is set to reprise his role as Nebraska’s starting punter in 2017, but this time he has some collegiate experience under his belt. In 2016, he punted 65 times for an average of 39.7 yards per punt. His longest punt came in right at 58 yards. Looking back at 2016, Lightbourn’s season was defined by big moments. He had a series of disastrous punts, including one that traveled for -2 yards in November. However, Lightbourn also shined in many other moments. One of those times was the Music City Bowl against Tennessee, where he punted seven times for an average of 42.7 yards per punt. “Whenever people ask me about [Lightbourn] I say that I had a shaky freshman year as well,” Brown said. “Most people do. It’s not easy to step into the bright lights like that, especially the situation that he had. He’s been working hard. Not only him but everyone. He’s one of the most talented guys I’ve ever seen, so he’s obviously got the physical makeup. Now that Lightbourn has the ‘mental edge’ that experience brings, his 2017 season looks to be brighter and more consistent than his last. The Huskers may still list Zack Darlington as a wide receiver, but he became known as Brown’s holder in 2016. There’s reason to believe he will continue with that role in 2017, so keep an eye out for more fun Twitter videos from Darlington. As for the long snapper position, Jordan Ober returns. As Ober told Hail Varsity last fall, he’s perfectly OK flying under the radar but he’ll continue to be the starting man at long snapper. Chase Urbach will back him up. Spring football (and likely fall camp) will determine whether or not De’Mornay Pierson-El continues his role as Nebraska’s starting punt returner. Many have assumed incoming freshman Tyjon Lindsey could play a role on special teams, but that will not be determined until fall when he gets to campus. As for the kick returner, Tre Bryant looks to reprise his role but, once again, it’ll likely be August before the true starters are announced. Regardless, an area of criticism in 2016 was special teams and with Read gone it’ll be interesting to watch how the staff handles these positions throughout the spring. For a closer look at other position groups, check out our spring football preview on the quarterbacks, linebackers, running backs, wide receivers, offensive line and secondary.